Mid-Autumn Festival, is one of the four traditional Chinese festivals (others are Spring Festival, Tomb-sweeping Day, Dragon Boat Festival). It is a popular harvest festival celebrated by Chinese people dating back over 3,000 years to moon worship in China's Shang Dynasty. The Mid-Autumn Festival is held on the 15th day of the eighth lunar month (which falls between the last), a date when the moon is supposedly at its fullest and roundest. The traditional food of this festival is the moon cake, of which there are many different varieties. In the Zhou Dynasty (11th century-256 B.C. ), people held ceremonies to greet winter and worship the moon when the moon became full in mid autumn. The custom was passed down to the Northern Song Dynasty (960-1127) when the 15th day of the eighth lunar month was formally named the Mid-Autumn Festival. Now when the festival sets in, people would sit together to eat moon cakes, appreciate the bright full moon cakes, appreciate the bright full moon, celebrate the bumper harvest and enjoy the family love and happiness. To the Chinese people, the full moon symbolizes family reunion, as does the "moon cakes." Hence the Mid-Autumn Festival is also called the Family Reunion Festival. At the Mid-Autumn Festival, people offer sacrifices and pay homage to the moon, and taste moon cakes. In ancient times, when celebrating the Mid-Autumn Festival, people set a large incense burner table in the courtyard bathed in silver moonlight, on which moon cakes, a water melon cut in the shape of a lotus flower, apples, red jujubes, plums, grapes and other sacrifices were placed. Under the bright moon, a portrait of Moon Goddess was put on a table, facing the moon, and red candles were lit. Then the family members paid homage to the moon one by one, praying for family reunion and safety. The custom of worshiping the moon originated from the capital city in the Northern Song Dynasty. On the night of the festival, all the people o f the whole city, men and women, old and young, put on the adult's clothes, burned joss sticks, paid respects to the moon and expressed their wishes, praying for the blessing of Moon Goddess. Many modern activities of appreciating the moon originated from the activities of worshipping the moon in ancient times. Now, the Chinese people invite friends and relatives to hold family reunion feasts for celebration at the night of the Mid-autumn Festival. After the feasts, they sacrifice moon cakes, fruits and wine to the full moon at the open spaces. Each would make a vow to Goddess of the moon at this time, young men hope to make a beautiful girl friend, conversely, the young girls hope to make a handsome boy friend and become more beautiful; children hope they can take a first class in their study; parents hope their children have a good luck in everything. After the vows, they begin to admire the full moon, taste moon cakes, drinking, chatting even dancing under the moon. In modern China, these are very common things to be done in the Mid-autumn festival. Actually, if you travel to different areas in China you will find some different way of celebration such as: putting pomelo rinds on one's head, carrying the alight lanterns, lighting lanterns on towers, floating sky lanterns, burning incenses to the moon, planting Mid-Autumn trees, collecting dandelion leaves and distributing them evenly among family members, perform the Fire Dragon Dances...these activities are so interesting that many foreigners hope to enjoy the festival with the Chinese families when they visit China during the Mid-Autumn Festival. Moon cakes were elaborate sacrifices offered to Moon Goddess at the beginning. As time goes by, people have gradually integrated the activity in praise of the moon with the moon cakes. Now at the Mid-Autumn Festival, people eat moon cakes to express their homesickness and love for their family member, and their hope for a bumper harvest and a happy life, as the moon cake symbolizes family reunion. Moon cakes made in various parts of China have different flavors. 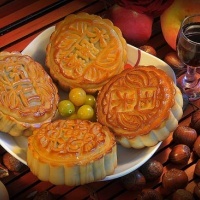 In terms of the places of production, there are Beijing, Guangdong, Suzhou, Taiwan, Yunnan, Hong Kong and Chaozhou moon cakes; in terms of tastes, there are sweet, salty, sweet and salty, and spicy moon cakes; and in terms of fillings, there are five kinds of kernels, sweetened beam paste, crystal sugar, sesame seeds and ham. Some moon cakes have pulp crust; some have sweet crust; and the others have thin and crisp crust. Tourists from all over the world must not forget to taste various kinds of delicious moon cakes at the Mid-Autumn Festival. 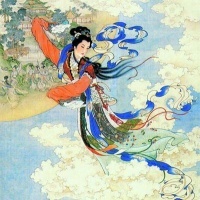 The Chinese people often associate the ancient legends with the silver moon at the Mid-Autumn Festival, such as "Chang'e Flying to the Moon," "Wu Gang Felling the Laurel Tree", and "Jade Rabbit Pounding Herbal Medicines into Pulp," making the festival full of dreamlike and romantic colors. Among, the much-told is Chang'e Flying to the Moon. In the time of remote antiquity, ten suns abruptly appeared in the sky at the same time in one year. On the earth, the water was drying up, the plants were withering, people and the animals were thirsty up. 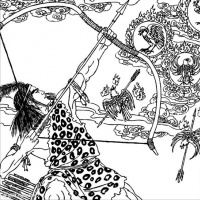 Houyi, a legendary hero who was a master of archery, saw the fact. He shot down nine suns and the earth survived. His merit was honored by the people, a lot of men sought instruction in archery from him. An evil guy called Fengmeng became one of his students. Before long, Houyi married a fairy virtuous girl - Chang'e. Houyi loved his wife very much and always stayed with her except the time of teaching and hunting. One day, Houyi get an elixir from Lady Queen Mother (the Heaven Master's wife in Chinese myth) while he was calling on his friends on Kunlun Mountain. It was said that a person could be immortal being immediately if the elixir was taken. However, Houyi could not want to fly to the heaven alone and let his wife alone. He gave her wife the elixir to keep temporarily. Unluckily, the secret was heard by evil Fengmeng. Three days later, Houyi planned to go out hunting with his students. Fengmeng pretended to be ill. He was promised to stay at home. Soon after Houyi and his other students left, Fengmeng took a sword and attempted to force Chang'e to give him the elixir. Without an urgent aid, Chang'e had to make a prompt decision. She swallowed the elixir and immediately flew out from the house, up to the sky. Worrying about her husband, Chang'e befell and became an immortal being on the moon (where is the nearest from the earth). At the dusk of the day, Houyi came back home. The handmaidens told him what happened, when he heard that news, he just wanted to kill Fengmeng. But Fengmeng ran away for a long time. The grieved Houyi, calling his wife's name, looked up to moon at night. To his surprise, he saw a figure just the same as Chang'e on the full moon. He hurried to set something what Chang'e like on the table in garden to express that he missed her. The date was just Aug. 15th on Chinese lunar calendar when the clearest and bright full moon appeared. When the people heard that Chang'e had flown to the moon and became an immortal being, they did the same thing as Houyi, not for love, just praying for blessing. Since then, a tradition has come out and last from generation to generation. Book a China tour for Mid-autumn Festival! This was really helpful for my project, thank you!! Thanks a lot.It really helped.